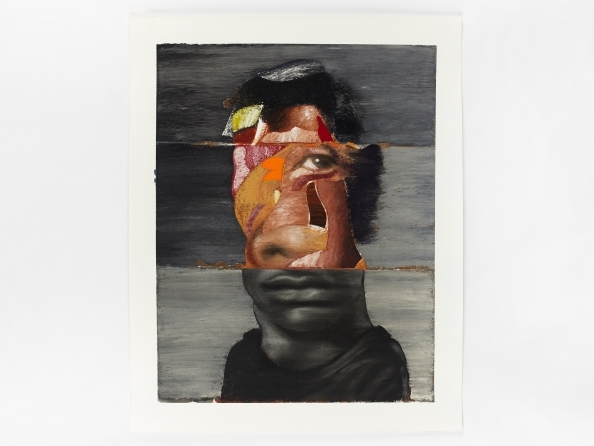 Nathaniel Mary Quinn, Junebug, 2015, Black charcoal, gouache, soft pastel, oil pastel, oil paint, paint stick, acrylic silver leaf on Coventry Vellum Paper, 50 x 50 inches. Rhona Hoffman Gallery is pleased to present Back and Forth, the first solo exhibition with New York-­‐based artist Nathaniel Mary Quinn. Fractured features, spliced patterns, and shrunken or distended proportions merge together to create Quinn’s abstract-­‐figurative works on paper. While seemingly assembled from collage, each of the ten artworks in the gallery is meticulously created directly on the flat plane of the paper surface to achieve the illusion that they are formed from exterior sources. His working methods are rooted in free association and intuition, evident in his use of color and pattern to either emphasize or recess certain facial feature. Quinn’s works are highly autobiographical and the genesis of each figure emerges from an intimate vision that reverberates with unresolved memories, feelings, or associations from his past experiences. A Chicago native, Quinn’s upbringing in the Robert Taylor Homes public housing was deeply impactful; violence, abandonment, and poverty were familiar obstacles in his personal narrative. In combining that history with an exhaustive range of source materials into his practice, his figures balance between grotesque and beautiful-­‐ threatening and alluring. Through this amalgamation, the regenerative human nature of surviving trauma, thriving against opposition, and fostering an identity are made palpable on the rendered bodies and faces. The figures also enliven topics and issues in his contemporary socio-­‐cultural moment. There is a dialogue in the contorted and collaged figures that places Quinn in a constellation of artists such as Francis Bacon, Lucien Freud, and Neo Rauch. However, Quinn’s practice and artistic intention remains oriented in his present day, where the specters of the past collide with the present context. An interdisciplinary artist based in Brooklyn, New York, Nathaniel Mary Quinn (b. 1977, Chicago, IL) received a MFA in Painting and Drawing from New York University and a BA in Art and Psychology from Wabash College, Indiana. Quinn’s work was first introduced to the public in a group exhibition with Artists Space Gallery in 2002 and through the Bronx Museum of the Arts in 2004. In 2014, Quinn had a critically acclaimed solo exhibition, “Past/Present” at Pace London Gallery. He is the recipient of the Lorraine Hansberry Artistic, Performance, and Fine Arts Award and a two-­‐time winner of the National Arts Club Prize. Past exhibitions have included the Museum of Contemporary and African Diasporan Arts, New York; Rush Arts Gallery, New York; The Bronx Museum of the Arts.